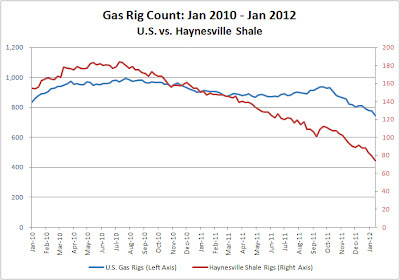 Haynesville Play: The Haynesville Shale Resource: When Will Haynesville Production Peak? With the low price of gas, the U.S. rig count has declined as well, although not as dramatically as the Haynesville count. Since its recent peak in the summer of 2010, the national count has dropped by 247 rigs, a decline of 25%. 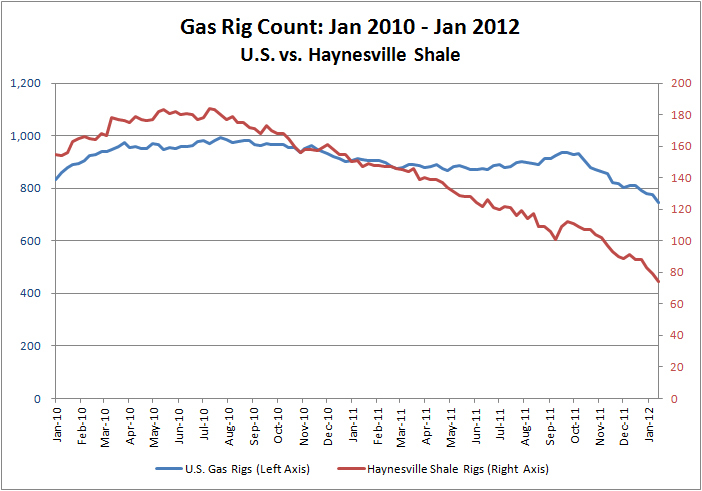 Over that same time, the Haynesville count has dropped by 110 rigs, or 60%. At the peak 18 months ago, Haynesville Shale rigs represented 18.5% of all working gas rigs in the U.S. That number is now 10%. With the inherent decline rates in producing shale gas, production in the Haynesville will start to fall at some point in the near future. The question is when? Summer? Fall? Will it even happen in 2012? The overall decline in gas rigs doesn't necessarily mean that national gas production will decrease because the overall rig count has actually increased over that same time by 357 rigs because of the addition of oil rigs. With the additional 600 or so oil rigs drilling, you will see lots of associated natural gas produced too. Rig count is a lagging measure, and it is not reflective of the quality of wells being drilled. Early Haynesville drilling activity was focused on covering the map with rigs to hold leases, many of which were in marginal areas. Many current drilling programs are focused on pad drilling in core locations and maximizing production, so it's a bit of an apples/oranges conundrum comparing current activity with historical. But with only 40% of the rig count from a year and a half ago, it is pretty certain that production will follow the downward path. But when will it peak?